This article is guest blogged by Paul Hoffman from My Two Cents: Thoughts of a Small Town Therapist. By definition, sport must be as objective as possible to be credible. Though recent advances in technology have vastly improved accuracy, human judgment remains. However, there are sports that are all judgment – though certainly they have standardized criteria – such as gymnastics and diving. There are sports where some aspects are subjective – such as baseball (determination of balls and strikes) or hockey (determination of a penalty). The most objective sports are those that quantify points scored or time elapsed. The sport of race walking has undergone many definitions in the past 136 years, most of it around the issue of ground contact. The principal difference between running and walking is that the former has a flight phase, and the latter does not. “That a racing walker must have contact with the ground with one foot during a stride, and with both feet at the end of a stride. That the heel of the front foot must touch the ground before the back foot leaves it. That as the heel of the front foot touches the ground the leg must not be bent, its knee must be locked. “Definition. Walking is progression by steps so taken that unbroken contact with the ground is maintained. In other words, you are allowed to break ground contact if no one observes it. Technological proof doesn’t matter. Whoever heard of being allowed to break a fundamental rule of a sport as long as no one sees? That is like allowing aluminum bats in baseball (as long as you’re not caught)! 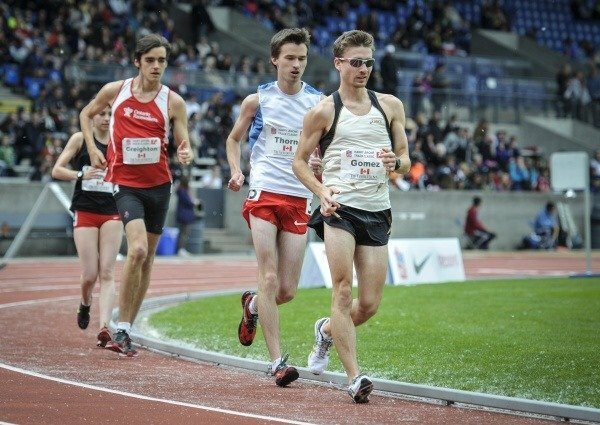 What is unique, and in my view, philosophically untenable about the current state of competitive racewalking, is that the essential and defining characteristic of the sport as a whole is subjective. Even in judged sports such as gymnastics and diving, the competitors are being evaluated on very specific elements. No one is being told that he is doing the sport completely wrong. But when a racewalker gets disqualified it’s because they are judged to be getting the sports’ essence all wrong. A sport must have primarily objective parameters, otherwise it’s art – an interpretive discipline. I think that the governing bodies of the sport should either allow or disallow a flight phase. No more, “you can fly a little but not a lot, depending on the judge’s vision”. The racers already know that they’re ‘flying’. If it were completely disallowed, they would maintain ground contact, because the cameras would catch them. If it’s allowed, then there will be no more splitting hairs. You have made an erroneous assumption in your article. You imply that no sport allows an athlete to transgress the rules in a manner that requires something more exacting that the judges visual process. There are many sports that require judging by eye that are not judged using electronic visual means as is the case with armchair critics and race walking. I can name a number of codes, and one that springs to mind is shot putting. The shot must be held in contact with the neck and under the jaw until the shot is “put”. I have never heard of a move to police this action by other than visual means. Why is race walking being selected for this type of criticism. The essence of the race walking rules are to place a simple method of judging that can be carried out at all levels of the sport, and that are fair to all. A race walker does not know that they are “flying”. They are attempting to walk within the rules (who wants a DSQ against their name) but may well transgress by trying too hard. There is a two-tier grading in the judging of race walkers. The first tier of judging is when a judge is unsure if the walker is “flying” or not, in this case the walker is given a warning that they are suspect. This only that, a warning, and there is no limit as to the number of warnings that can be given by other judges as well. If the judge then sees the walker “flying”, then a red card is entered into the process. There does not need to be a warning given before a red card is issued. If three judges (or more) have seen the same walker infringing, then the walker is disqualified. The visual process of judging does rely on the expertise of the judges to ensure that blatant transgressions are not the norm. There are a prerequisite number of judges needed for an event. “How can a racewalker not know they’re flying!! They teach people to fly! From Austin Racewalkers………..
A sport cannot have its essence determined by subjective nanoseconds. BTW……I’m a racewalker and love it. I just think ground contact should be maintained…period…because it’s objectively verifiable. ps I’d love to know how many shot putters get disqualified for chin placement. Clearly it’s a non-issue compared to modern racewalking’s intrinsic problem. If it can be accepted that my level of competence in race walking stems from being both a race walking judge and, might I say, an elite level competitor, I feel that I can speak with some authority. I have competed at (open grade) world championships and held (hold) a large number of masters world records. Take it from me, when walkers are striving to get the fastest performance, they are attempting to get an effort that will produce a “float” stage in their stride. It is a known fact! However, they know that they are flirting with the judges’ interpretation of their technique. To deliberately go slow to be safe would be ludicrous. The best techniques are more likely to gain acceptance by the judges. There will be a slight difference between the style of a 50km walker and that of a 3000m walker. In both cases, the walker will be attempting to gain the longest stride-length possible by keeping the trailing toe in contact with the ground as long as possible. Sometimes the stride-length in front of the body may be shorter, producing a faster turnover or cadence, but the overall intent is to maintain that double-support phase where both feet are on the ground, albeit possibly producing a slight flight phase that is not seen with the naked eye in some cases. Gary, You’re still missing my point. “Wang Liping of China won the inaugural women’s 20-kilometer walk today in Sydney, Australia. It was a race that degenerated into high farce. Wang won in a time of 1 hour 29 minutes 5 seconds after the three walkers in front of her were disqualified in the closing stages after each had been ahead. The Australian Jane Saville was the last to be thrown out just as she entered the stadium, immediately bursting into tears. The silver went to Kjersti Plaetzer of Norway, with Maria Vasco of Spain taking the bronze. Liu Hongyu of China, the world and Asian Games champion, and Elisabetta Perrone, a silver medalist in the 1996 Olympics 10-kilometer event, were also disqualified for failing to maintain continuous contact with the ground. Could this happen in any other sport? Of course not, because no other sport is so nebulously subjective. Walking is walking (ground contact); running is running (loss of ground contact). The modern rules of the great sport of racewalking have created a running event with a walk-like gait. It doesn’t have to be that way. Racewalking, for its first 134 years was defined by unbroken ground contact. And now we have the technology to objectively verify it. Defining a sport by a parenthetical “to the human eye” in an age of great technology is, in my view, absurd. The Sydney Olympics situation brought about a change in the judging process, but more about that later. A sport that requires the competitors to comply with the rules, or be disqualified, would, I think, be the norm. Rules are made to try to make “a level playing field” and anyone who breaks the rules should be penalised. Take the game of rugby, a player who infringes can cause his team to be placed at a disadvantage. Not really a big problem. However, if that player continues to infringe, he/she then incurs the wrath of the referee to a greater extent to the point of being ordered off the field, sometimes temporarily, sometimes permanently. Quite often the spectators are not really sure of the reason for the decision, particularly in scrums. The referee has made his decision. You refer to “Racewalking, for its first 134 years was defined by unbroken ground contact. ” and disqualifications did take place in the past. Rest assured on that. However, one important fact emerges from that era. The public and spectators did not have the advantage of slow-mo cameras and other technical devices. They could only see a small part of the course. Race walking has two main rules, and both of these are part of the differentiation between running and race walking. The other rule relates to the actual action of the walker’s knee during the support phase of a leg. As a race walker that has been disqualified in the past, I have no qualms regarding the judging process or the interpretation of the rules. In actual fact, the better (stricter) the judging, the better the race. One of the criteria that some walkers use, is to walk to the level of the judges’ abilities. Going too far can lead to misery. Now to the Sydney debacle. At the international level of competition prior to this event, the red cards that had been completed by judges with regard to infringements, were held by the judge until they were collected by a cyclist before being handed to the race secretary and chief judge. This caused some considerable delay between the time that the third red card was received, checked and then passed as a correct document. Only then could the disqualification of the walker be deemed to be correct. It would then be a further amount of time before the walker came past the chief judge and could be removed from the event. In a 20km event, this might well be 15 minutes and as the walkers would all be attempting to advance their placing at the latter part of the race, problems did occur. Perrone stated after the event, that she had continued on after her DSQ until she had seen the notifications actually entered on the infringement board that is available for the walkers to see how they have been judged. There is every possibility that she had received a number of “cautions” (as they were called in those days) before the third red card had been issued. There may well have been more red cards. I mentioned earlier that a walker need not receive cautions before having red cards issued. This may well have been the case with the disqualification of Jane Saville. She may well have been unaware that her technique had deteriorated to such an extent that she was then transgressing. Her poor technique may well have been only over 500 metres and been seen by three judges in that distance. That is all that is needed to bring about a DSQ. This, and other aspects of the race, were enacted out in front of the public by virtue of the cameras around the course. Something that was not available in the past. Armchair critics now had the ability to be hyper-critical. Harking back to my earlier reference to rugby and its’ rules. In the past, the referee’s judgement on whether a contentious try was a try or not was purely up to his official judgement. In international games, technology is now regularly used to verify the correctness of the placing of the ball. In this case, the event is a single instance and although more than one camera may be used, the observation is for that instance alone. In race walking, there are a number of contestants that are usually spread out over part (or all) of the course. The judges are placed at regular points around the course and observe each walker as they go by. It is at this point that the judge makes a decision as to whether the walker is legitimate and takes action if necessary. The judging system does not have the ability to see all the walkers at all times. That would be a technical nightmare. In an attempt to tidy up the process of judging, and the administration that goes with it, international races now have the judges equipped with direct radio contact so that delays are minimised. By not trying to use sophisticated technical aids during judging, race walking has ensured that the judging standard should be the same for the local Saturday competition, as that which is used for the elite international level of participation. I don’t think I have missed the point, I just feel that not enough research has been done on the technical aspects of judging of other sporting codes and the interpretation of their rules. Thank you for a very nice summary of some of the main developments in competitive walking rules from the time of Charles Westhall (1862) to the 1996 racewalking definition. As a freestyle athletic walker who says “nothing that maintains continuous contact with the ground is alien to me,” I have a take on these issues that’s maybe not so often heard. The biggest issue, in my view, is that the athletic discipline of walking is vastly larger than “racewalking” under the 1996 rules, or even the somewhat broader field of heel-and-toe style in the usual sense (erect posture, heel strike, and smooth roll from heel through toe, generally producing at least relatively straight knees during most of early stance phase). Such pedestrian greats as Captain Barclay two centuries ago in the UK, and Edward Payson Weston in the USA in the late 19th and early 20th century, were known for their notably bent-knee techniques. In France during the 1890’s, E. J. Marey and others developed the “pas-de-flexion” or flexion gait as what became a standard technique for quick and sustainable military marches, maybe one source for the style that Groucho Marx was parodying with his famous gait. 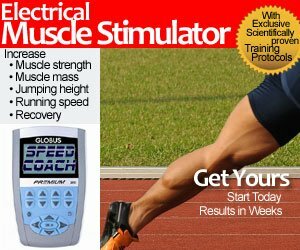 But the best test for our discipline is the 1949 IAAF or Stockholm rules: they include heel-and-toe, normal ordinary walking, and bent-knee techniques up to and including grounded running from a biomechanical point of view — as long as contact is maintained with a true double-support phase! And I would hasten to add that people legal under the 1996 rules, with what I might call an “unbroken optical illusion of continuous contact” plus a very strict biomechanical limitation on leg flexion, should also be considered part of the discipline of walking. Just as grounded runners are paying the cost in efficiency of not being airborne, so those abjuring the kind of knee action which could be used to exploit a brief flight phase are facing a real athletic challenge not faced by ordinary runners. Racewalking under the 1996 rules would thus be a subdiscipline or event-type of walking, just as the breaststroke with its form rules is an event type or subdiscipline of swimming. The legalized flight phases (on the order of 0.030 seconds, or the threshold of visual perception) could be seen as a special feature of this event type, together with the strict leg-extension rule. And the 1996 rules might be rewritten, or at least a commentary issued, to say that the “optical illusion” of contact is precisely the test! In my view, there should be as many walking events as running events. 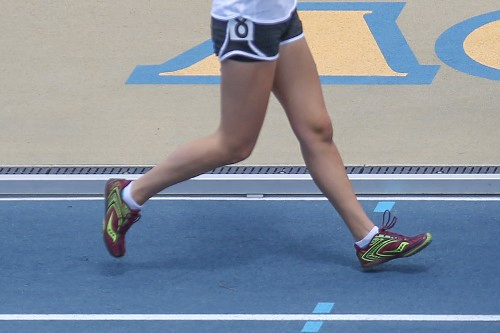 In “Classic Heel-and-Toe” or the like, maybe a 100K race at the Olympics, the traditional contact rule would be strictly enforced, either by time penalties for “dubious contact” (where it appears likelier than not that some oldstyle lifting is occurring), or by technological means such as video analysis or shoe devices. French champion Alain Moulinet suggests that a longer distance would make speeds where flight-phasing is likely (beyond 12km/h or so) less attractive as race strategy. The form rule should at least permit normal walking with a slightly bent knee, while it could exclude obvious forms of fast creeping or crawling. There should also be pure Freestyle Walking, a “land speed race” analogous to the land speed record for automobiles where any technique is legal as long as it maintains contact. The 1949 IAAF rules ideally define such an event type, which might be interesting as a 100K cross-country race. We might have many ultramarathon runners pleasantly surprised to find that their technique is legal walking for this event “off the shelf” or with minimal adaptations! The 1996 rules, in my view, reflect the evolution of elite racewalking practice in the later 20th century — but let’s not forget the rest of the discipine as it can be and should be defined, with room for everyone from Masters walkers having problems with the 1996 leg-extension rule to ultrarunners who may be legal walkers already under the 1949 rules without knowing it! As soon as it’s clear that the 1996 rules define an event type, not the whole discipline of walking, the current controversies may be seen in a better perspective. Margo, thanks so much for your fabulous, thoughtful contribution to this dialogue! Thanks for your input. The images from Jack illustrate very well the flight phase of a competent elite style walker. This type of style may or may not be noticed as “loss of contact” by a judge depending on the judge’s competence. Remember though, that there are more than one judge officiating and although a suspect style (should get a warning at least) may get past one judge, others may well record it in a different manner. Race walking is not just a competition of speed, but also a competition of style, and a good style is less likely to be adversely judged. Judges do look for other actions by the walker that may indicate transgressions. Judges that appear to be having different results to those of others, may well be asked to undergo more judging training. Over recent years, there has been a movement (no pun intended) to have differing levels of walking competition due to various styles of technique. However, these styles are not classed as race walking. Many events now include a “B” grade race where slightly bent knees are acceptable, but the rules try to define what slightly bent means. Sometimes similar expressions to “not to appear to be running” may be included in the rules, but they all usually have a “no loss of contact” factor. The rules relating to ultra-distance events where runners and walkers are competing at the same time, usually on a track, quite often include a specific set of rules for the walkers that would not comply with IAAF rulings. However, the contact rule is always applied and here again, the competence of the judging is important. Due to the slower cadence achieved, loss of contact is rarely a problem. 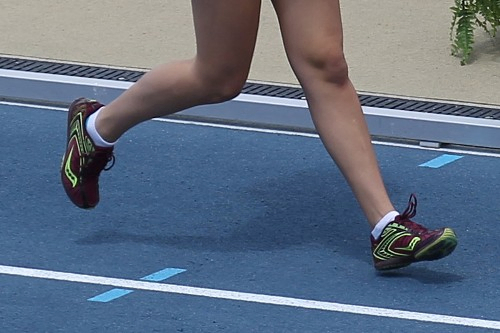 Comparing the gait of the runners to that of the walkers, can sometimes be a problem (no rules for the runners) as some of the runners run with a very bent-knee style (sometimes called “creeping”) that has a continuous ground contact, hence the need for the walks judges to be able to differentiate between runners and walkers and judge accordingly. The bottom line in ultra-walking, is that the style should appear to be of a walk and not that of a runner, and to maintain visual ground contact. These are the basic rules of the “Centurions” competitions where walkers attempt to complete 100 miles in 24 hours. Thanks, Gary, for some remarks which greatly advance this dialogue! Your point about how judges will look at a person’s style in context, although addressed to a loss of contact question, can be very relevant to knees also, and to the categories and rules for the different classes of events we’re discussing. Here I’ll try as much as possible to follow your terminology, and to emphasize where we agree. (1) Aspiring heel-and-toe walkers who in good faith strive to maintain a reasonably upright posture, striking with the heel at an angle so as to roll through the whole foot from heel to toe. While the spirit is willing, the knee joints are weak, tight, injured, or simply not adequately trained enough to be legal under the 1996 racewalking definition. Here your remarks about the totality of a walker’s style become relevant — and, under the “B” or Centurion rules, the walker is happily legal! (2) Many new walkers may choose to make a brisk natural gait their main competitive technique, at least at first; and walkers practicing racewalking or some allied heel-and-toe style may seek “normal walking” breaks — a luxury permitted runners, however unstylish it might seem for some elite marathoners, but not 50K racewalk contenders! In most normal walking, the leg is “relatively” or “significantly” straightened, but not enough to satisfy the 1996 rules, with a notable degree of flexion occurring immediately after contact in response to ground reaction forces. Under the “B” rules, we reach the intuitive result that normal walking is legal in a walking race! (3) Some people may walk at a slow to moderate pace, up to or a bit beyond a usual brisk walk, let’s say, with a markedly greater flexion of the knees, and often also the hips, than we generally see in natural everyday walking. Aesthetically, this may be the antithesis of a classic heel-and-toe style; but competent heel-and-toers should generally have little problem matching and overtaking a mere brisk walker, however flexed that walker’s knees or hips! The B-walks and Centurion events provide a safe haven for all of these not-so-flawless athletes, a purpose deserving the respect and support of all walkers! Beyond the contact rule, there’s an understanding, often spelled out as you have noted, but sometimes left unwritten, that racewalking will be the fastest legal technique used at these events. Fast creeping turns that understanding upside down, whether we define it by the late and great Jack Tregurtha’s test of “looking like a runner,” which you have also explained in very similar words, or by some biomechanical criterion. One benchmark for “fast” creeping might be breaking the Froude barrier, around 10 km/h or 6 mph, the fastest speed that the laws of physics allow a human to attain with normal inverted pendulum walking. 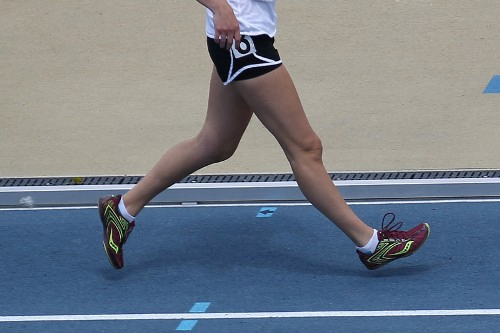 The intent of “B” or Centurion events, as well as racewalking events, is that only recognizable heel-and-toe techniques are used to break the Froude barrier. There’s a simple and educational technique for protecting these events and making them yet more inclusive at the same time: recognize a special category of competition known as “grounded running” or even “fast creeping,” where the contact rule and only the contact rule applies, with the 1949 IAAF walking rules as a fine definition. Grounded runners will compete only against each other, and also against any ordinary runners — leaving racewalkers and other usual “B” walkers to compete exactly as intended. Judges will judge grounded runners for contact only, and may caution any whose technique makes contact hard to determine: “Either modify your technique, or slow down a bit so that I can be sure you are following the rules.” As one version of the Centurion rules states, it’s always the responsibility of the walker to demonstrate good contact, more so than in a racewalk where “clear” evidence of loss of contact is the standard for a red card. As soon as we have grounded running or fast creeping in a separate and recognized category so that it doesn’t affect the usual walking results, the “B” and Centurion walks can go on as expected — but with an extra category to liven things up a bit! And grounded runners should definitely have colors or other identification setting them apart from usual categories of walkers, to avoid any appearance or reality of unethical conduct. Since mixing in a bit of grounded running may not be exactly what the Centurion tradition calls for, maybe there could be a “Centipede” certificate for ultracreeping 100 miles in 24 hours with continuous contact (of course, more usual walking techniques including heel-and-toe would also be permitted). If I reached that level of skill and endurance, maybe I’d go for the traditional Centurion one year, and the “Centipede” the next! Here’s an analogy: we can think of racewalkers as like NASCAR drivers, and ordinary runners as like jet pilots who definitely have a “flight phase” as part of their normal technique! A walker who deliberately practices fast creeping or grounded running is like Andy Green, the driver in 1997 of the jet-propelled supersonic car that for the first time broke the sound barrier on land — without benefit of Chuck Yeager’s famous flight phase 50 years earlier! The fact that Green, unlike Yeager, maintained continuous contact with the ground, was precisely the point. However, his “wheeled” vehicle is not the kind of “wheel-driven” vehicle reasonable to permit in NASCAR competition, although it may rightly be recognized as a kind of “car” in its own class. The land speed records, in fact, have a special “Class C” for jet-propelled vehicles like Green’s, as well as other classes for vehicles which are wheel-driven cars of a more familiar variety. Anyway, this rather special issue aside, having venues where interested and curious walkers can compete without worrying about the straightened-leg rule, and are legal when they use a natural gait, is exactly what the “B” and Centurion walks achieve. They vastly increase the accessibility of the discipline, and can’t hurt in attracting potential racewalkers who might make the elite grade. But beyond that, they fulfill the promise of walking as a discipline that people can participate in as long as they can walk — even if in nonelite or “minor league” competition, bent knees and all! By the way, if certain veteran events threaten to turn into grounded running matches, there’s a simple solution: the judges can gently caution walkers to slow down until they look like walkers and pass Tregurtha’s Test! (There could also be True Freestyle where their technique would be legal as long as they maintain contact, but that’s another story.) We get them happily across the finish line, and we all get along as an inclusive family.